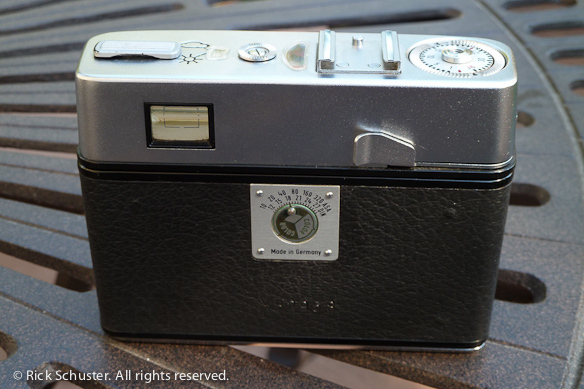 To see images shot with this camera, select the Category at right. This cute little camera belongs to my friend John, who lent it to me in hopes of me getting it working. I succeeded in some respect, but also managed to damage an inner lens element, which I’ll describe below. This camera is really one of the cutest cameras I’ve ever seen. 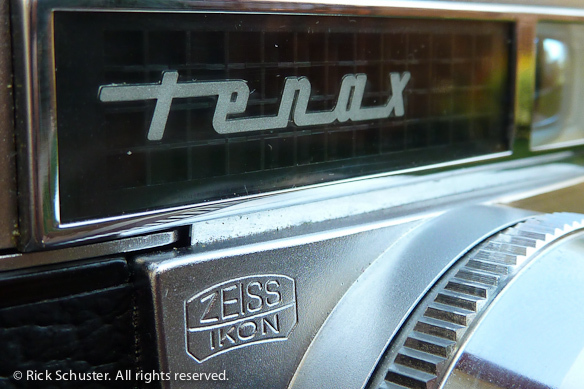 The big, bright viewfinder is one of the first things you notice, especially because of it’s unusual metallic look to the glass coating. And the viewfinder is extremely big and bright in use. 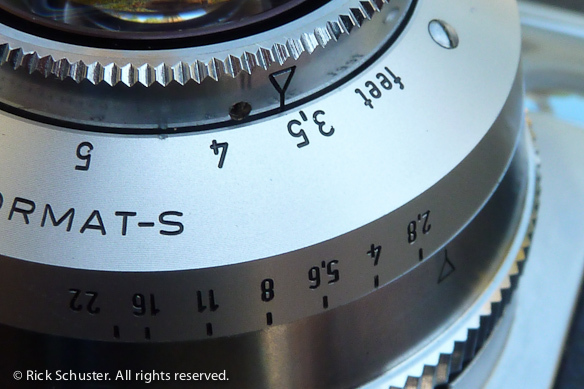 It’s a fully automatic-exposure camera — just set it to A, guess your focus distance and shoot. 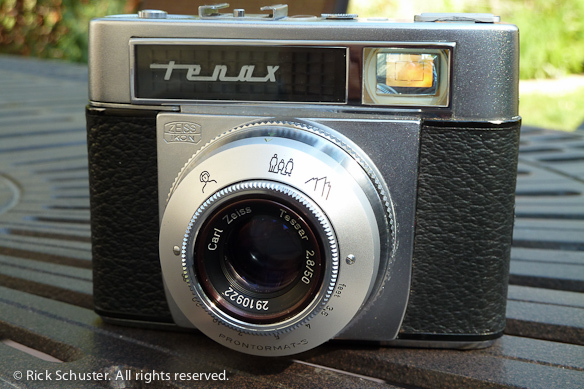 I wish it had a rangefinder instead of just zone focusing, but it’s fun and easy to use nonetheless. 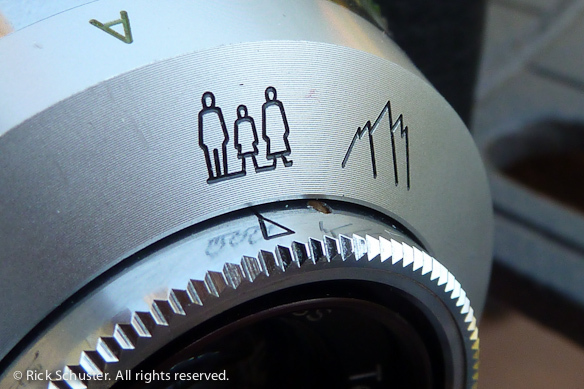 There are aperture settings marked on the bottom of the lens, and by depressing a small metal lever on the side of the lens you can take it out of A mode. I thought initially that this would make it act in aperture-priority automatic exposure mode, but in fact those settings are designed only for use with flash. It locks the shutter speed at something like 1/30 sec. in any of those aperture settings. After getting it working, I loaded up a roll of film and tried it out. I think the the small chip that I made at the edge of the inner lens element added a little bit of extra flare and maybe some edge haziness when shooting toward sunlight, but overall it performed well. 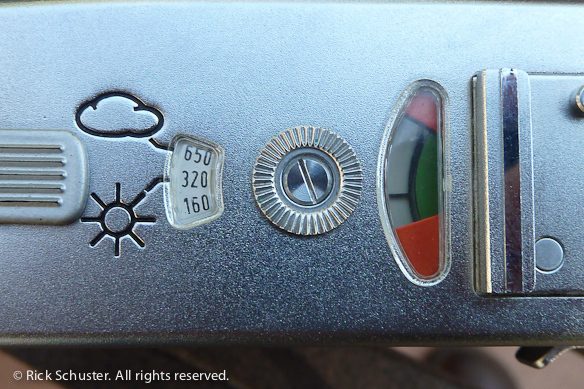 You set the film speed on the top, and change the setting depending on whether it’s cloudy or bright. The film rewind knob that pops out of the bottom of the camera is wonderfully functional. or use the actual distance markings on the bottom. The shutter was not firing at all when John gave it to me, though it would wind and make kind of a half-click when you pressed the shutter button. I figured it just needed some cleaning of the shutter blades that were probably stuck together, so I took it home and got to work on trying to access the shutter blades. On some cameras this can be a really easy task, on others not so much. This one fell into the latter category. It looked like removing the rear element wouldn’t be too hard, but I don’t have a proper spanner wrench to reach into the deep recess behind the lens. My split-ring pliers that serves as a good spanner wrench substitute was a little too bulky to reach in the small opening. So I set about trying to remove the front lens elements. 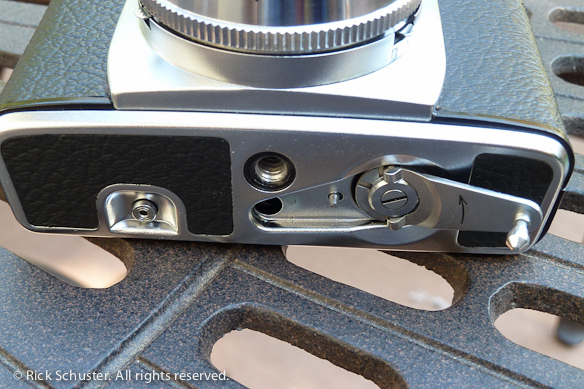 By setting the focus at the nearest setting, three tiny screws are visible on the outer edge of the knurled knob that you use for focusing. I marked the position of this knob so I could return it to the proper position later, then removed the three screws and lifted it off. This allowed me to turn the front lens element counter-clockwise to remove it (after first carefully marking it’s position). With this removed, the center lens element can be reached, but it was fit snugly into a recess, and didn’t come out easily. I tried prying gently at the edge of the lens, and managed to make a small chip in the edge of the lens. Not good! I later tried again and was able to remove the element — it just took a little work prying and jiggling gently with my fingernails on the edge of the lens element. Once open, I was able to clean the shutter blades with q-tips and Coleman fuel, and got it firing pretty reliably. It is still hanging up now and then, and sometimes just taking a second to shoot after you push the button. A complete strip-down and cleaning of the shutter would probably work wonders, but I wasn’t ready to tackle that.